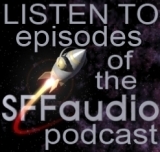 SFFaudio was created in 2003 by Scott Danielson and Jesse Willis. Our goal was to tell the world about the cool stuff we were listening to. Since then we’ve added a bunch more contributors, reviewers, and even an editor! We think audio is the best medium for Science Fiction literature and drama. We’re not against the dead tree, cathode ray, and celluloid versions, we just know them to be the inferior medium for transmission of story, mood, and ideas. Before the creation of printed books, stories were told by the Greek aoidos, the Celtic bards and other poets of the human voice. After the printing press allowed for greater numbers of “novels” to be written, the families and friends in all the households that could afford to buy them would gather together and spend their evenings reading books aloud to each other. In the late 1970s the audio cassette allowed for the creation of a new industry, a new medium, the audiobook. Over the last three decades new technologies, CDs, MP3-CDs, and especially the portable MP3 player have made the audiobook even more popular. Audio drama, too, is our passion. It goes by many names: audio theatre, audio cinema, and of course “radio drama” – the name of the place where it got started. We love this stuff. And if you’re reading this, we bet you do too. Want to send us something for review? Drop us an e-mail for more info. Or just mail it to us. Want us to plug or review your podcast/audio drama/online audio? We post about stuff all the time. If you’ve got a new SFF related online audio coming out, then we want to know about it. Your submission will stand a better chance of being mentioned if you send a 120X120 pixel logo (.gif or .jpg) for your podcast project, along with a brief description of the project and the plain RSS feed for it (should it have one). Jesse, a co-founder of SFFaudio, is a teacher in British Columbia, Canada. He studied Science Fiction and Fantasy as an amateur in his youth and has taken one credited university course on the subject (in the Womens Studies department at Simon Fraser University). Jesse enjoys reading (and listening) to Science Fiction, Fantasy, Horror, History, Crime, and Mysteries, writing about what he listens to and talking about himself in the third person. A co-founder of SFFaudio and a fiction writer, Scott lives in Utah, USA. He shows up now and then to check on the place. Tamahome is actually not an anime character, but frequently reads and listens to Science Fiction. He also watches genre TV and movies, reads comic books, and wrestles computers to the ground. Dani is a podcasting political activist and audio drama booster in Arizona, USA. Her podcast, Truth Seekers, exorcises falsehoods and assumptions by constantly questioning the epistemology of American politics. Her blog, The Audio Addicts, on the other hand, is a blatant propaganda campaign for Audio Drama. And we see the two as completely consistent. As an editorial assistant to the Fookien Times Philippines Yearbook, blogger extraordinaire (check out Bibliophile Stalker), and very cool guy, it is our great pleasure to have often multiple contributions per day from Charles. Avid reader Jenny Colvin is relatively new to science fiction, and is partial to post-apocalyptic death and destruction, cyberpunk, and dystopia. She blogs about books over on Reading Envy. Blogger Julie Davis, among many other pursuits, reads novels and excerpts on her wondrous Forgotten Classics podcast. Reviewer, writer and podcaster Paul Weimer is just this guy, you know? In addition to him popping up on SFFaudio, he is an SF Signal irregular and a co-host of the Skiffy and Fanty Show podcast. Akim Bischoff, Cory Myler, Kurt Dietz, Mary Robinette Kowal, Michael Bekemeyer, Mike Hinds, Paul Cole, Scott A., Steen Hansen, Stephen H. Wilson, Stephen Uitti, Tony Smith, and the infamous Time Traveler. Rick Jackson, a former reviews editior, and a current senior reviewer, is busily expanding his audiobook company Wonder Audio (look for his terrific classic fiction at Audible.com and in the iTunes audiobook store). He also runs one of the best podcasts in the galaxy, The Time Traveler Show. If you have a podcast, radio show or blog grab our nifty 33 second promo |MP3| and make us popular! Ya, we do too. Our banner was created by Douglas Triggs (he also made the banners for Escape Pod and Star Ship Sofa). We have a Yahoo! Group. For those of you who use Twitter… http://twitter.com/sffaudio.